VITE A TESTA CILINDRICA ZINCATA 3,5X16 CON IMPRONTA CROCE PZ. FINITURA ZINCATA Cr3, CrVI FREE. ADATTA PER L AVVITAMENTO SU PANNELLI TRUCIOLARI, LEGNO MASSELLI DURI E TENERI, FERRAM..
VITE A TESTA CILINDRICA ZINCATA 3,5X20 CON IMPRONTA CROCE PZ. FINITURA ZINCATA Cr3, CrVI FREE. ADATTA PER L AVVITAMENTO SU PANNELLI TRUCIOLARI, LEGNO MASSELLI DURI E TENERI, FERRAM..
VITE A TESTA CILINDRICA ZINCATA 4X16 CON IMPRONTA CROCE PZ. FINITURA ZINCATA Cr3, CrVI FREE. ADATTA PER L AVVITAMENTO SU PANNELLI TRUCIOLARI, LEGNO MASSELLI DURI E TENERI, FERRAMEN..
VITE A TESTA CILINDRICA ZINCATA 5X25 CON IMPRONTA CROCE PZ. FINITURA ZINCATA Cr3, CrVI FREE. ADATTA PER L AVVITAMENTO SU PANNELLI TRUCIOLARI, LEGNO MASSELLI DURI E TENERI, FERRAMEN..
VITE A TESTA MEZZA CILINDRICA ZINCATA 5,5X35 CON IMPRONTA TORX TX. FINITURA ZINCATA Cr3, CrVI FREE. ADATTA PER L AVVITAMENTO SU PANNELLI TRUCIOLARI, LEGNO MASSELLI DURI E TENERI, F..
VITE A TESTA MEZZA CILINDRICA ZINCATA 5,5X40 CON IMPRONTA TORX TX. FINITURA ZINCATA Cr3, CrVI FREE. ADATTA PER L AVVITAMENTO SU PANNELLI TRUCIOLARI, LEGNO MASSELLI DURI E TENERI, F..
VITE A TESTA MEZZA CILINDRICA ZINCATA 6X30 CON IMPRONTA TORX TX. FINITURA ZINCATA Cr3, CrVI FREE. 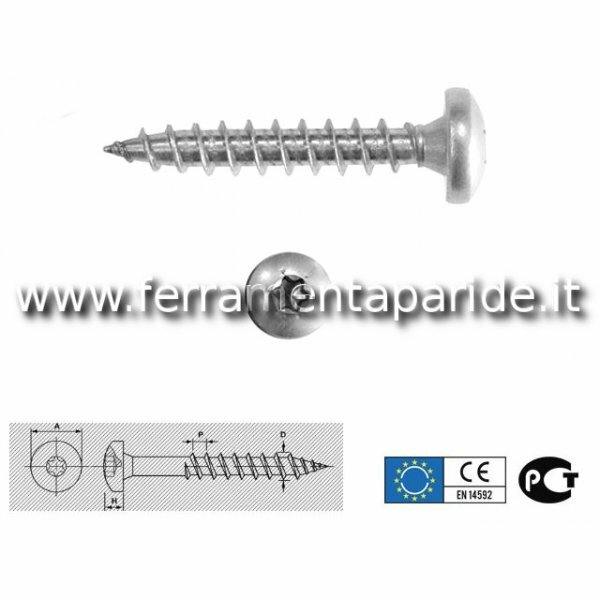 ADATTA PER L AVVITAMENTO SU PANNELLI TRUCIOLARI, LEGNO MASSELLI DURI E TENERI, FER..
VITE A TESTA MEZZA CILINDRICA ZINCATA 6X35 CON IMPRONTA TORX TX. FINITURA ZINCATA Cr3, CrVI FREE. 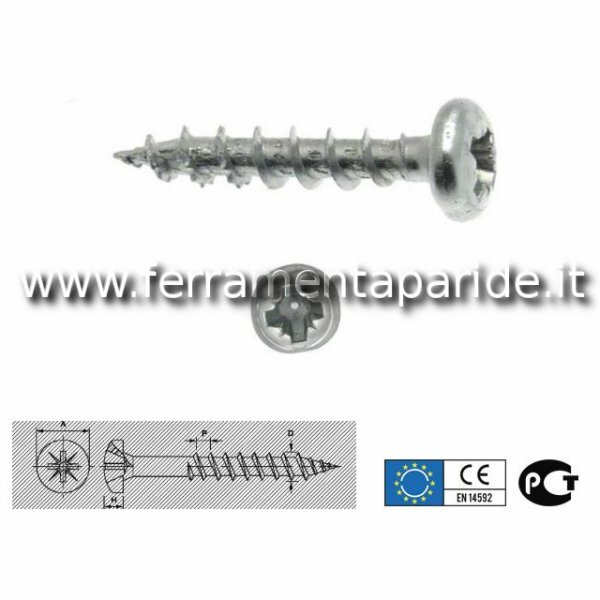 ADATTA PER L AVVITAMENTO SU PANNELLI TRUCIOLARI, LEGNO MASSELLI DURI E TENERI, FER..
VITE A TESTA MEZZA CILINDRICA ZINCATA 6X45 CON IMPRONTA TORX TX. FINITURA ZINCATA Cr3, CrVI FREE. ADATTA PER L AVVITAMENTO SU PANNELLI TRUCIOLARI, LEGNO MASSELLI DURI E TENERI, FER..
VITE A TESTA MEZZA CILINDRICA ZINCATA 6X50 CON IMPRONTA TORX TX. FINITURA ZINCATA Cr3, CrVI FREE. ADATTA PER L AVVITAMENTO SU PANNELLI TRUCIOLARI, LEGNO MASSELLI DURI E TENERI, FER..
VITE A TESTA MEZZA CILINDRICA ZINCATA 6X60 CON IMPRONTA TORX TX. FINITURA ZINCATA Cr3, CrVI FREE. ADATTA PER L AVVITAMENTO SU PANNELLI TRUCIOLARI, LEGNO MASSELLI DURI E TENERI, FER..